First Line: The last thing he remembered was the pattern on the carpet, barbed strips of indigo and puce-like bruises inflicted by alien implements, then a steel toecap coming at his face. Detectives Zigic and Ferreira are called in from the Peterborough Police Hate Crimes Unit to find the killer of a man who was locked in a garden shed and burned to death. It's not going to be easy. There are no witnesses and no fingerprints. The only thing the two do know is the identity of the victim: he was an immigrant with a long list of enemies. There may be a long suspect list, but no one wants to talk. Zigic and Ferreira are deep in the territory of slum racketeers and people-trafficking gangs-- and people are afraid. Eva Dolan's first Zigic and Ferreira mystery features two very different leads. Zigic is older, married, used to people being unable to pronounce his name, and adept at not letting people's intended-- or unintended-- racism get to him. Ferreira is the opposite-- younger, female, opinionated (sometimes to the point of blindness), convinced that she knows what's best and determined not to put up with any of this racist crap. Dolan gives readers two different approaches to solving hate crimes, and between the two detectives, they get the job done. I can't say that I warmed to either character. Zigic is almost too quiet, too used to flying under the radar to avoid obstacles and get his work done. On the other hand, Ferreira is too abrasive and pig-headed, and although I didn't like her, I have to admit that I'm interested in seeing if her personality changes the longer she's on the job. Dolan has created a strong mystery with a very human touch. Migrant workers play an important role in the story, and readers could very well feel uncomfortable as they learn why migrant workers are used, how they are abused, and how all levels of society look at them. The burned corpse that brings the two detectives to the scene leads to other crimes, and I enjoyed watching everything unfold-- the teasing out of whodunnit and the motives from the rest of the threads of the plot. 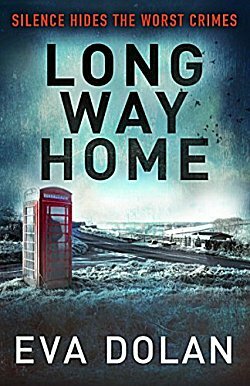 Long Way Home is an enlightening, sometimes uncomfortable, read with two strong leads and an intricate, engrossing plot. I know I will be visiting with Zigic and Ferreira again in the future. I'm glad you enjoyed this one, Cathy. I really liked the two main characters, very much (I hope you'll warm to them more in their next adventure), and I think Dolaln does the setting well, too. Dolan does the setting very well, and it's obvious she cares deeply about her subject. What motivated Eva Dolan to write this book was outrage at the mistreatment of immigrant workers. Her Twitter statements conveyed that. She said that readers were shocked about the conditions and abuse faced by immigrant workers. So, she did a good job of muckraking, of exposing this mistreatment. I have read all four of the books in the Hate Crime Unit series and like them, but this is a favorite. I like Zigic and his normal family life. In the series he is shown as a thinker and yet is skillful as a detective. Ferreira is more complicated and harder to like. She's had a harder time being a woman and an immigrant. In the second book, something life-transforming happens to her, so it's worth continuing to read the series. I am disappointed that Dolan ended the series after four books, but her stand-along, "This is How it Ends," is coming out in January. Though normally frugal, I will buy this book as I know the writer always has a lot to say. Thanks for the background info, Kathy. I knew this was a series that you feel passionate about.